Most Slovenian vintners, unlike many Czech and Moravian winemakers, are calmly awaiting their country’s EU accession. They are well prepared, and they’re experienced with unregulated markets. Slovenia, the wealthiest country of the former Yugoslavia, has the highest standard of living of any of the countries entering the EU this year. This is borne out by their viticulture. Carefully tended vineyards, first-rate processing technology, tradition, and well-educated people – all of this accounts for the very fine quality of Slovenian wines. Slovenians manage about 40,000 hectares of vineyards – more than twice that of the Czech Republic, but still comparatively small on a European scale. There are three wine regions that produce about a million hectoliters of wine each year in these 20,251 square kilometer country, which is home to two million inhabitants. In the south is Primorsko, which is divided into four wine districts. 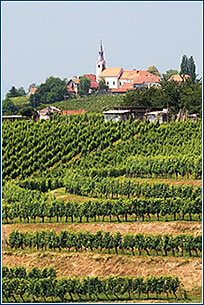 To the east of the capital, Ljubljana, lies the Posavje region, which also contains four wine districts. In the north, on the hillsides around Maribor near the Austrian and Hungarian borders, is the Podravlje region, which has six wine districts. Right in Maribor there is a true curiosity to be seen – a grapevine that is over 400 years old (stara trta) that climbs the facade of a historical building. And you can even sample some wine from its fruit. Slovenian winemakers are well aware that they don’t have much of a chance with the most widespread global varietals when competing with the giant producers. So they carefully tend their original varietals – Šipon, Teran, Ranina, Kraljevina, Pinela, Zelen, and Rebula – while planting more. A popular wine called Cviček is one of their particular specialties, and an exception was made for it in the EU. It’s a light, pale red wine made by mixing white and red wines. 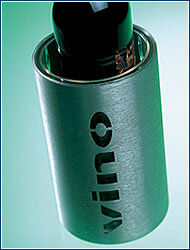 it has a greater concentration of tannins, and an alcohol content of up to 10%. It goes very well with fatty foods, or it can be consumed simply to quench a thirst. The finest refreshing, crystal-clear white wines come from the Maribor area, and outstanding reds come from the Primorsko region, but all of Slovenia’s wines are worth sampling. The author is the editor of Hospodářské noviny’s IN magazine. How do you keep your wine the right temperature after taking it from the cellar or fridge? Buying a table cooler can solve the problem. This one, called LEO, is made of plastic (imitation stainless steel) and costs CZK 900. Visit the Cellarius club during the “We Travel for Wine” cycle in March: March 16, a tasting of Tanzberg wines; March 23, Vinselekt ing. Michlovský; and March 30, Mikrosvín Mikulov. For more information, visit www.cellarius.cz. If you want to get out of the city on April 3, you can go to Znojmo to sample the finest Austrian and Moravian wines. Local winemakers and Ampelos (Improvement Wine Station, Znojmo) organize this wine exhibition, along with tastings. For more information go to www.ampelos.cz. We chose various lines from a major producer in a district that is a part of the Primorsko wine region, and it lies on the hills above Terst, Italy. On the Czech market its wines are priced comparably to the more expensive Slovenian wines. A typical example of the Merlot varietal, which is not yet very well known here, as it grows better in countries with more favorable climates. A pleasantly drinkable dry wine with a dark ruby hue that is a part of the producer’s basic line. The Quercus line of wines is named after the Latin word for oak, and this wine’s aroma and flavor testify to its having been aged in oak casks. High-quality grapes give it a full, harmonious body, pleasant fruitiness and long persistence. A varietal from the Bagueri line, this is one of the finest products of the Goriška Brda cellars. In Slovenia the 2000 vintage was extraordinary, and this gray Burgundy is a great example. Complex and harmonious, richly fruity in aroma and flavor. A well-balanced, successful cross of two classic French red varietals. It is very rich, made from high-quality, ripe grapes. An outstanding palette of harmonically balanced aromas and flavors from ripe wild fruit, raspberries, blueberries, and blackberries. All these wines are made by Vinska Klet Goriška Brda, Dobrovo, Slovenia (www.let-brda.com) and can be bought at the WineShop, Havelská 27, Prague 1. Tel. : 224 222 483, www.winegarden.cz.